The European team had a very exhausting but successful week last week. Some months ago, we discussed the possibility of holding a user meeting at our headquarters in Weiterstadt, Germany. During our stay in Wiesbaden it became a tradition to do at least one user meeting or workshop a year. Because of our move to Weiterstadt and the development of some new structure in the European organization, it took quite some time to plan another user meeting. In spring time, we discussed how to satisfy the different areas in Europe regarding language and also how to transfer information about new technology to our distributors. We finally decided that we should organize 3 different meetings during the week of October 15th. 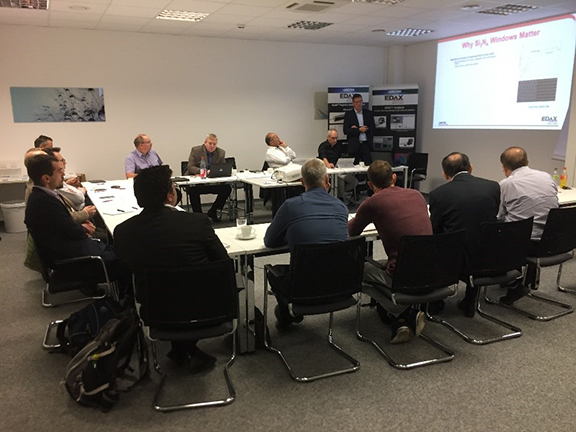 The first two days were for our German speaking customers in Europe, mid-week we invited our distributors and on the last two days we offered a user meeting for our English-speaking customers. There was a lot of organization to be done, like making hotel reservations, preparing presentations, organizing hosting and also booking nice restaurants for the evening events. All of us were a bit nervous about whether everything would work, whether we had forgotten anything important and whether our SEM and system would work properly. The week before the meetings we installed the Velocity™ camera, our new high speed EBSD system in our demo lab and our application people were very happy with the performance and had fun playing around with it. 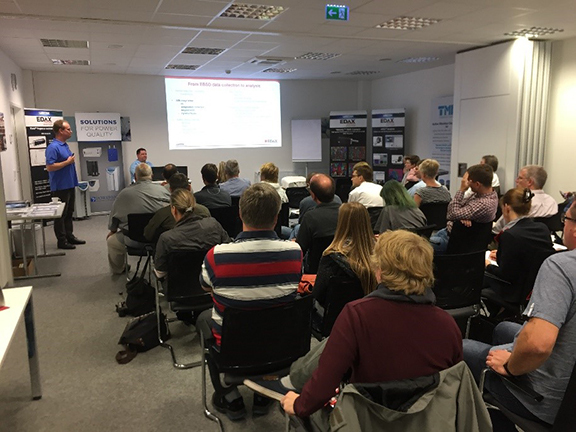 On Monday October 15th we started our first user meeting in the Weiterstadt office at around 1 pm with customers from the German speaking area. Around 45 participants joined the meeting. At the beginning we gave an overview of our current products and explained that our complete SDD series is using the Amptek modules with Si3N4 windows. Based on some spectra we showed the improved light element performance. After that Felix, one of our application specialists, showed our new user interface APEX™ live and the discussion which arose showed the interest from our users. Although only some users are doing EDS on a TEM we explained a little bit about the differences between EDS on a TEM and on a SEM. We finished the first day with a question and answer session and invited all the participants to a nice location in Darmstadt to have a typical German dinner together. The next day was completely dominated by EBSD. Our EBSD product manager Matt Nowell, who came from Draper, USA to support us during our meetings, demonstrated the performance of our new Velocity™ EBSD camera. Matt also explained the differences in the camera technology using CCD or CMOS chips and described direct electron detection. It was easy to get more than 3000 indexed points per second while measuring a duplex steel with the Velocity™ camera. Our EBSD application specialist René de Kloe presented a lot of tips and tricks regarding EBSD measurements and analysis of measurement too and did not get tired of answering all the questions. At the end of our program all participants left with a good feeling having learnt a lot and got some good ideas about how to improve their measurements or what they might try to measure on their own samples. The next day we shortened our program for our distributors and explained our product range and gave live demonstrations of APEX™ software platform and the Velocity™ CMOS EBSD camera. This day was dominated by a lot of discussions with the group and also by questions about our roadmap for 2019. 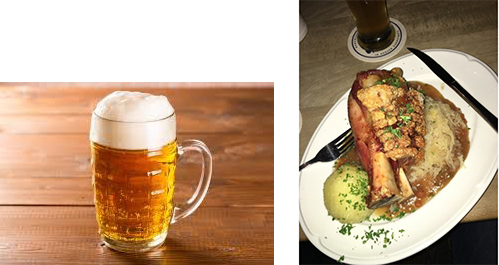 On Thursday and Friday of this week we did the same program for our English-speaking customers in Europe as we did for the German speaking customers. We had around 15 participants. Late on Friday evening the whole European team was very happy that we managed the week with all the meetings and that based on the feedback we got it was a successful week. You may be sure that all of us went home and had a relaxing weekend! I would like to thank Matt, Rene, Felix, Ana, Arie, Rudolf, Andreas and Paul and especially our customers who gave some interesting presentations about their institutes and the work they are doing there.